My Summer is starting out fantastic. I returned from a trip to CO on Wednesday and Thursday and Friday was spent sewing with great friends. In the Spring and Fall we gather at a friend’s house and she hosts a week of great sewing and fun. I went with the intention of clearing some items from my UFO lists, but ending up adding two terrific projects. I will be posting the sewing projects soon, but I wanted to share the new dessert I tried. Each of us will take turns providing lunch or dinner for the crowd. When I shared with some of my other girlfriends my intentions, they said “You are trying out a new recipe on them without making it first?” My thought was what better way to try a new recipe, if they are true friends they will give me their honest opinion and they loved it! I got this recipe off of Pinterest with a link here to the original blog. 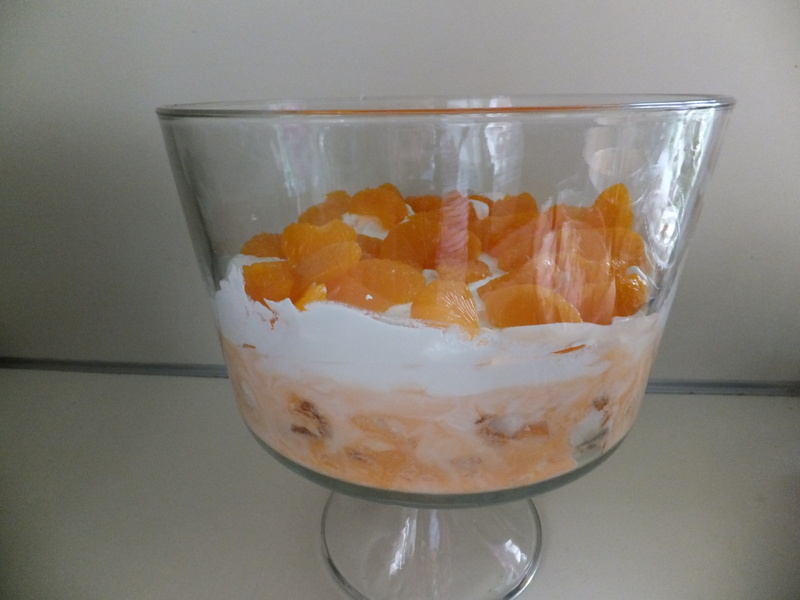 I would have to rename this “Jet Bar” Trifle, because when I was in Grade School (pre-Mrs. Obama) if you finished your school lunch you could purchase a Jet Bar. The Jet Bar was really the same thing as this Dreamsicle, but my memory screams Jet Bar. It was orange sherbet with vanilla ice cream in the middle. I didn’t get a chance to eat at school very often. Back in the day, we walked to school and walked home almost everyday for lunch. No, I am not going to tell you it was 10 miles in the snow, but it was maybe a half a mile each way and we would have logged about 2 miles per day. There were no school busses in the city and NO snow days. OK, enough of my healthy childhood…on to the good stuff! Drain 1 cup liquid from mandarin oranges. Bring to a boil in the microwave. 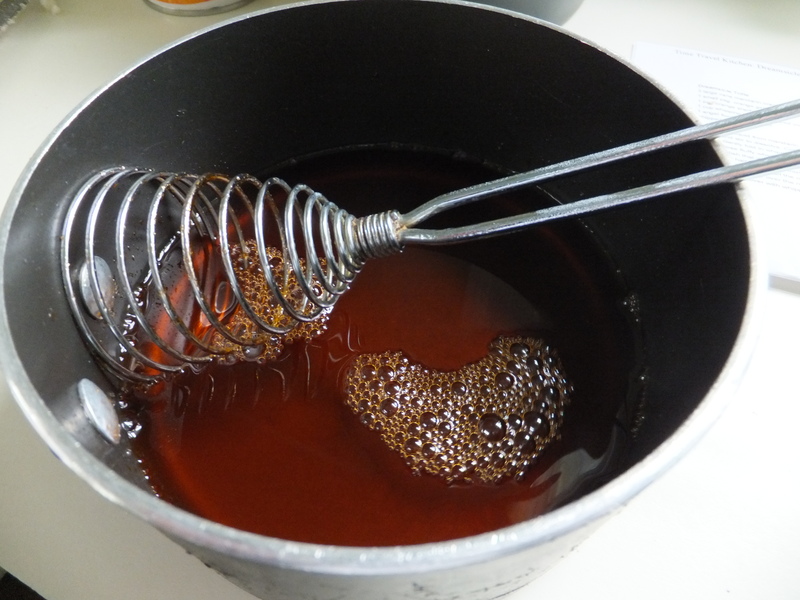 Add gelatin, and stir to dissolve. Cool until just warm. 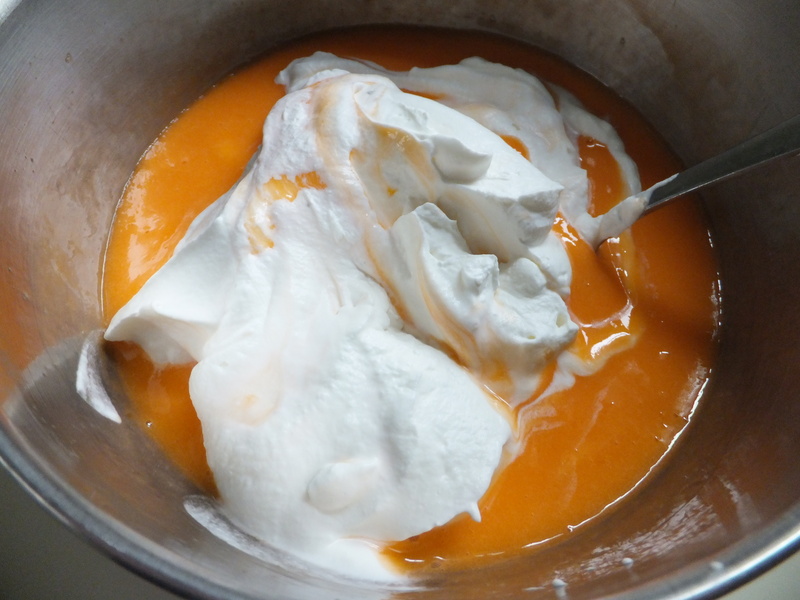 Add orange sherbet, and mix until melted. 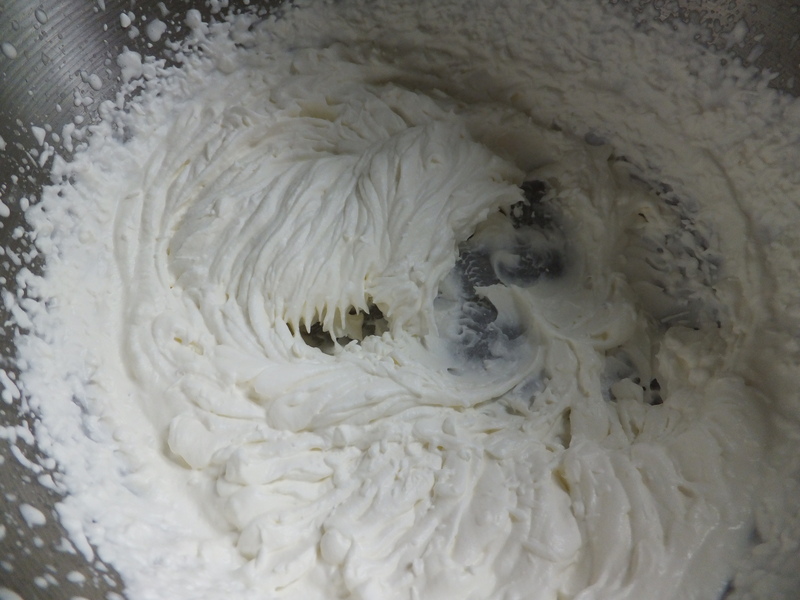 Gently fold in whipped cream. It is okay if there are uneven streaks, just don’t smash those fluffy whipped cream bubbles. Put half the cake cubes in the trifle dish (or other dish that is not as fancy), cramming them together so they will stay in a tight layer. 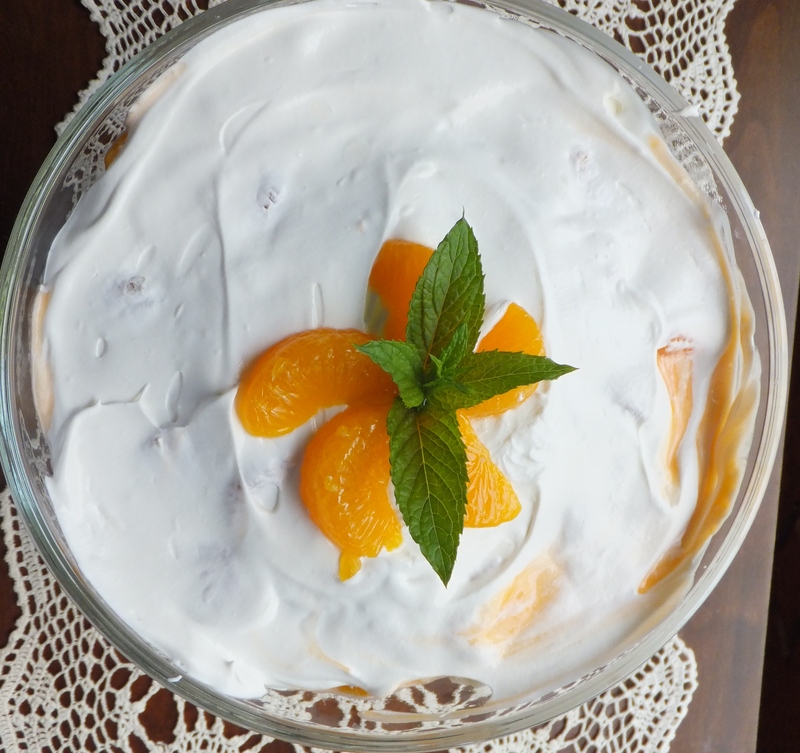 Pour half the orange mixture over the top, cover with a thin layer of whipped topping, and top with half the oranges. 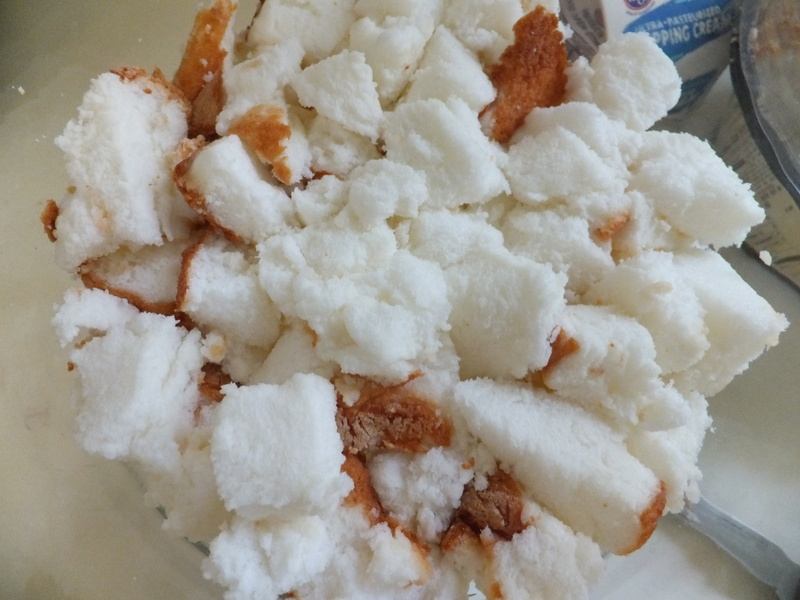 On top of the oranges, put the remaining of the cake cube in, pour over the remaining mixture, cover with the remaining oranges and cover with whipped topping. Refrigerate. These directions are directly from the Time Travel Kitchen blog. Now here is where I ran into a problem. I am whipping cream challenged! I have always avoided the use of whipping cream and this was the first time I tried it and I failed! It looked more like cream cheese and I was told I over beat it! It still tasted fine. 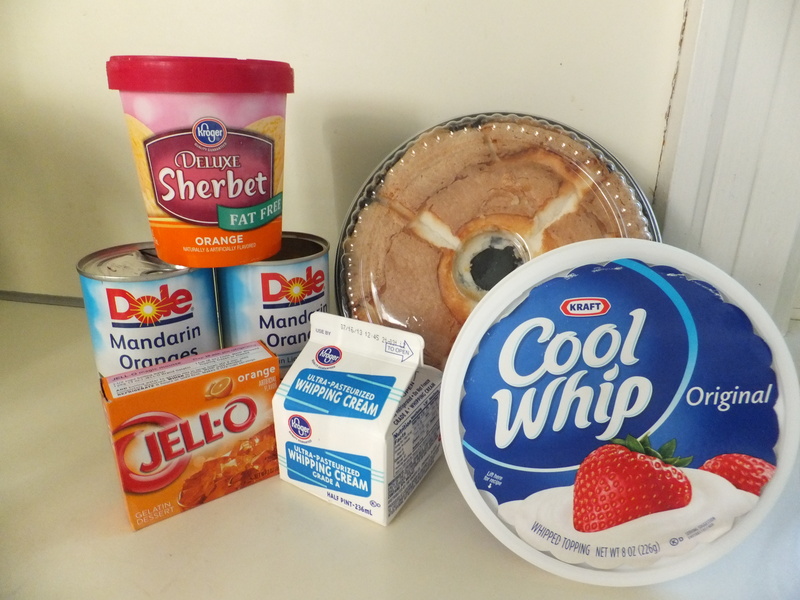 I really think you could just use a large Cool Whip and avoid the whipping cream all together. I will try that next time and I will also have to have my sister give me “whipping cream lessons”. I you go to the original blog she will show you a fancy orange peel twist to put on top. I took the easy way out and put some oranges on top and added a sprig of peppermint! They loved it!